By Clyde Hall, Brendan F. Hodgdon, Mickey Rivera. Our Week In Review sums up our weekly comic book coverage while taking time for a new review or two before it’s all over. Did we miss your favorite books this week? Well. This is where you need to be. 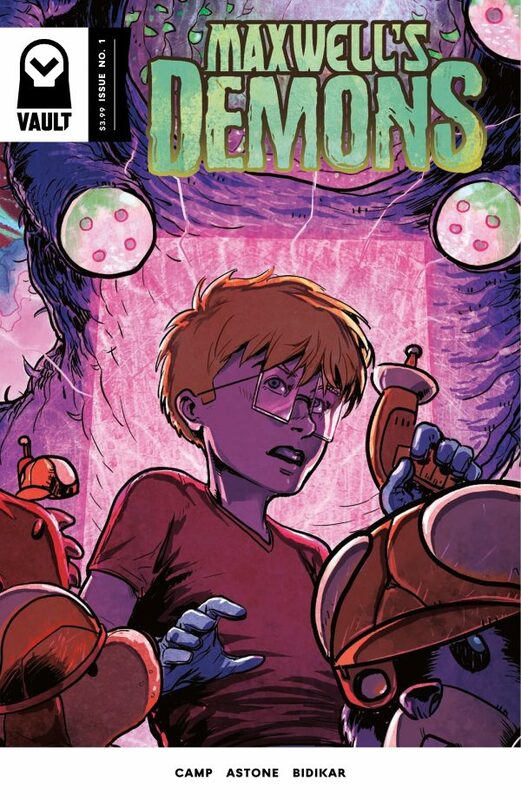 BFH: If you’ve ever wanted to know what a Pixar movie directed by David Fincher would look like, I would suggest you take a look at Maxwell’s Demons. In the latest gem from Vault Comics, writer Deniz Camp and artist Vittorio Astone have crafted a story that in other hands could have been a sweet, cathartic YA adventure, but in theirs makes for a dark and emotionally challenging read. The eponymous protagonist of the book, Maxwell Maas, could easily compare to the heroes of stories like A Wrinkle in Time or Coraline: a child goes on an otherworldly adventure and in the process confronts something from within himself or herself. Camp’s script really nails the beats of this kind of story, establishing Maxwell’s sad reality and then offering him a cathartic and fun adventure, then subverting that by revealing the darkness behind the escape. But it’s in the denouement of this first issue that Camp sets his tale apart. It presents a conclusion that feels like a perfect extension of what’s come before, but still leaves you feeling unsettled and frightened of where Maxwell will go from here. This is supported beautifully by Astore’s art, which is well suited to both whimsical YA adventure and spine-tingling dread all at once. He conveys a lot of the sadness of Maxwell’s reality, and handles the various tonal shifts with ease. And his designs for everything from monsters to cyborg stuffed animals are filled with character and personality. Considering the wide-open backdrop that the premise provides, I can’t wait to see what Astore brings to life in future issues. All in all, this is a killer first issue that promises a great deal, and I’m sure this creative team will deliver on all of it. CH: ‘Emissary of a cosmic god’ induces visions of Galactus’s many space-borne heralds. But what if the empowering entity wasn’t bent on planetary nourishment, but returning to the mortal dimension from banishment and spreading an insane level of evil? You’d expect his chosen one would be a fiend of the highest (lowest?) order, slinging eldritch bolts and perverting the Prime Material. Or, maybe he’d just be a former plumber with an octopus head. A blue collar working stiff, one without ambition or imagination enough to unleash Hell and make a comfortable living doing it. 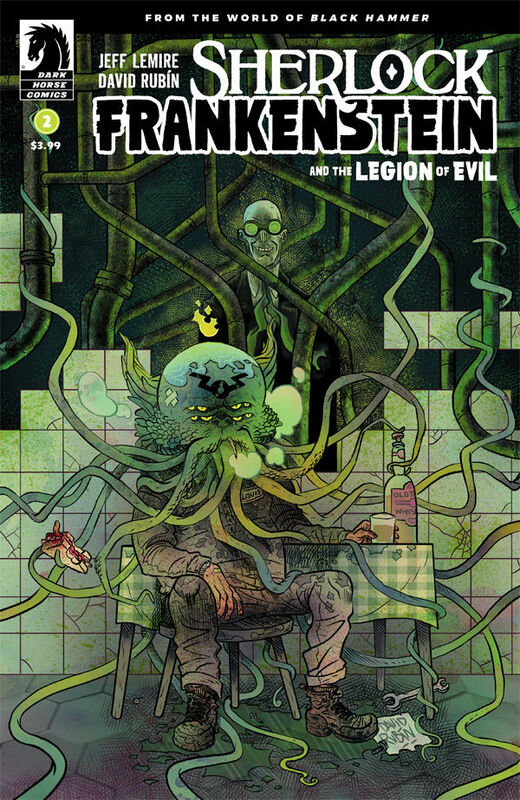 It’s a great twist, and adeptly presented by writer Jeff Lemire in Sherlock Frankenstein and the Legion of Evil #2. Reporter Lucy Weber continues investigating the disappearance of her superhero father, Black Hammer, in an interview with retired supervillain Cthu-Lou at his low-rent apartment. She also encounters his shrewish wife and their daughter, Cthu-Louise. Lucy makes a touching connection with the latter, feeling empathy for the misshapen child, superhero-daughter-to-supervillain-daughter. And it’s hard not to be impressed with Lou Kaminski. During his criminal career, he refrained from hurting anyone. He never made his emissary gig pay well, but he also didn’t go stark-starving mad despite the Dark Lord’s ongoing telepathic directives. You’re left feeling that any of us, given such a dark gift, could do more with it than this poor schmo. This character exploration is reminiscent of finer moments in fare like Wild Cards, with vaunted heroes suffering Clay Feet Syndrome, and despised villains often more woeful than wicked. Artist David Rubín brings the proper pathos, plus a flashback scene of Lou’s initial transformation that would make a dandy horror film sequence. The mystery widens, the danger mounts, and we’re left wondering: Is Cthu-Lou harmless, or simply hiding in the open, biding his Master’s time? MR: Combining science fiction with psychoactive substances is a time honored tradition among readers eager to trade their earth-bound ennui for interplanetary nonsense. Sci-fi stoner comedies, oddly enough, aren’t really a thing. 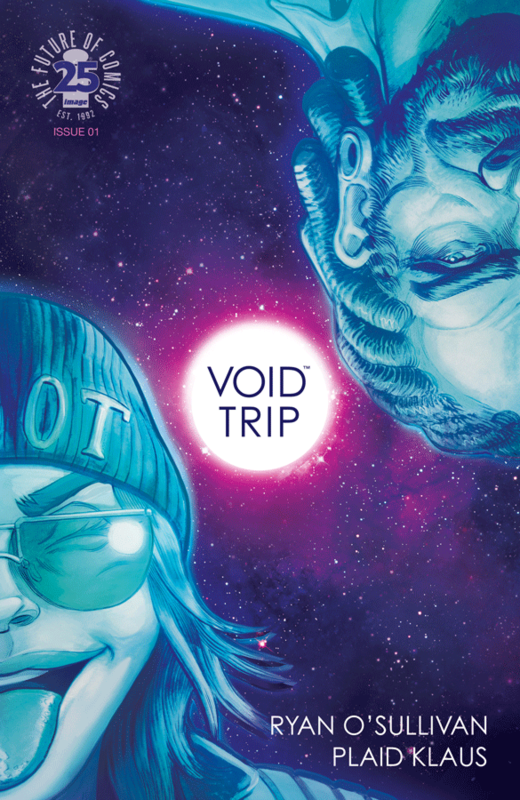 Void Trip takes a commendable stab at being science fiction’s Pineapple Express, but stereotypical gags and a lack of direction hold it back. Ana and Gabe, Void Trip’s main space slackers, traverse the galaxy selling illegal hallucinogenic fruits and evading capture by murderous space cops. Ana’s words and looks have been lifted from every teen stoner flick from the 1970’s and 80’s. She plays the tweaked-out fool to Gabe’s withdrawn grumpiness. Though occasional bursts of genius rescue her from being a one-dimensional joke faucet, Ana’s obviously trying to be the life of the party. She’s like that friend who is always high and believes every word they utter is comedy gold, to the detriment of Gabe, who more or less exists to react to Ana’s half-baked ramblings. There’s this “isn’t it hilarious that we took a drug? !” vibe emanating from the whole book. Drug-use isn’t innately cool or funny. It’s about more than ingesting a substance that, to use Ana’s words, “might make you feel like a wizard.” While Gabe and Ana vaguely declare their intent to seek out a mystical stoner promised land, and also happen to have heavily armored authorities on their tail, the comic thus far hinges on the personalities of these two characters rather than their goals or adversaries. Thus, they should have more on offer. I want to traverse the universe. I want to try every space-drug available and I want to talk to pink squid-people in pinstripe suits. But I’m not sure Void Trip is going to get me where I want to go.